High permittivity materials, in the form of “dielectric pads” are used in neuroimaging and body applications to improve B1+ homogeneity and intensity or to reduce corresponding SAR measures. In 3D, systematic pad design is computationally intensive with very long associated simulation times. We propose a hybrid solution to this problem by combining the flexibility of FDTD to model complex background configurations (coil/shield/subject) with an integral equation approach that takes the presence of a dielectric pad into account. This solution leads to speed up factors of 30 – 40 compared with conventional FDTD approaches and enables effective 3D dielectric pad design. 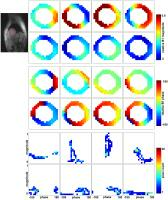 This work presents a study on the performance of several least-squares optimization algorithms used for localized in-vivo B0 shimming. Seven different algorithms were tested in 4 different shim volumes in the brain: global shimming region, single slice, and single voxels in two different positions with 3rd order shimming at 7T. Each algorithm's robustness and convergence were tested against noisy inputs and different starting values. The results give an interesting overview of the properties of each algorithm and their applicability. The regularized iterative inversion algorithm proves to be the best algorithmic approach suited to this problem. Full matrix pre-emphasis was used for slice-wise dynamic shimming. 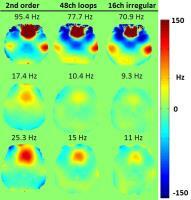 This study entails a comprehensive, theoretical analysis of B0 shimming capabilities in the human heart. 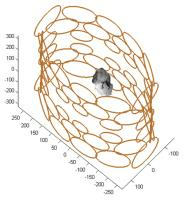 Three-dimensional B0 distributions over the in vivo human heart are addressed with various spherical harmonic and multi-coil shimming (shimming with individual placed magnetic coils to modify the B0 field) approach in a static, dynamic and a hybrid fashion. The results of the study show that, as expected, the global standard static spherical harmonic shimming (clinical standard) are generally inferior in comparison with the results of specifically tailored and customized shimming methods based on dynamic and multi-coil approaches. It is a big challenge to produce as homogeneous as possible B0 static magnetic field. Susceptibility differences between the tissue and air introduce inhomogeneities especially pronounced at high fields. Recently proposed close fitting array of circular loops provide improvement in B0 shimming. Based on the same concept, we proposed coil elements with irregular shape. The shape of the coils was designed by using of genetic algorithm. Theoretical investigation showed that performance of the 16 channel array of irregular elements was comparable or better than 48 channel array consisting loop elements. Integrated RF-shim coils combine RF receive arrays and matrix shim arrays into a single set of close-fitting loops, provide a promising alternative to spherical harmonic shim coils for compensating dynamic high-order B0 offsets in the brain. However, the potentially large design space for optimizing these arrays remains little explored. In this work, we investigate ways to improve the efficiency of RF-shim coils by (a.) creating “hybrid” RF-shim arrays that use additional shim-only loops over the face for targeted shimming of the frontal lobes and (b.) using a genetic algorithm to choose optimal subarrays of coils for shimming, thus reducing hardware complexity. Spatial variations of B0 in the region of the spinal cord are known to cause many artifacts. 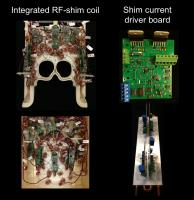 Local combined RF/shim coil array could provide an alternative to spherical harmonic shim coil. 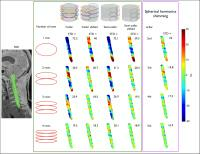 Here, we simulated several realistic coil array geometries for spinal cord imaging and demonstrated that arrays of 16 coils could outperform 3rd order spherical harmonic shimming in the ROI. Simulations also revealed that precise configurations for the coils can improve shimming performance without SNR loss. A flat Halbach array consisting of an array of long, thin permanent magnets whose magnetization orientation varies linearly with position, has the interesting property of generating a unilateral field perturbation. Such a pattern of field variation could be usefully employed in MRI, for example for attenuating signals from surface structures. Here we show that a Halbach array can be formed by exposing appropriately oriented strips of material with anisotropic magnetic susceptibility to a strong static field, and also validate the predicted behaviour in experiments carried at 3T using a 40-element structure formed from pieces of pyrolytic graphite sheet. RF shimming usually aims at uniform transmit field. For 7T human first-pass myocardial perfusion, maximizing the lowest transmit field strength is beneficial. The shimming optimization cost function corresponding to the lowest strength is not smooth, leading to impractically long shimming calculation if all transmit magnitudes and phases are optimized simultaneously. We evaluate several optimization strategies for static RF shimming for maximizing the lowest transmit field strength within a practical duration, and propose a two-stage method to accelerate in situ shimming calculation. In our experiments, this proposed method consistently found near optimal solutions in less than 10 seconds. We demonstrate a low-cost (<$75/channel), open source, scalable, multi-channel current supply board that can provide up to 8 amps per channel for driving inductive loads such as local B0 shim coils. The design shows excellent stability while retaining sufficient gain in the audio frequency range to reject disturbances (e.g. gradient switching) and maintain stable output current.